Google announced on its Google Drive blog today that it is rolling out an updated Google Drive app for Android that includes a couple notable new features. You can swipe between files to see large previews that let you quickly review and discover the information you’re looking for. And if you want to keep some Drive files on your Android device, you’ll now be able to “download a copy” from the actions menu inside settings. 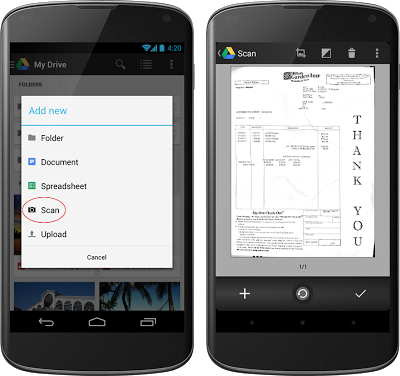 Another big update included in the latest version of Drive for Android is the ability to ‘scan’ and store physical documents as PDFs. The new scan option will allow users to snap photos of documents and save them within Drive as a PDF. Thanks to Optical Character Recognition, you’ll also be able to search for the scanned docs using keywords.